One of the more interesting parts about being a neuroscientist is when I'm suddenly struck by how absolutely weird our brains are. And I'm not even talking about the super trippy stuff like free-will; even the mundane things are really mind-boggling. For example: what does it mean to experience the world around us? We "see" things because photons that manage to pass through the inside-out design of our retinal cells cause a molecular change in the photoreceptors such that 11-cis-retinal isomerizes... etc. When we "hear" things, the sound pressure waveform hits the tympanic membrane (eardrum) and ultimately causes the basilar membrane in your cochlea to vibrate. The basilar membrane is stiffer at one end (the basal end) and less stiff at the other end (the apical end). This fact was observed by Georg von Békésy (and earned him the 1961 Nobel Prize in Physiology or Medicine). Okay, great, so we know a ton of the basic biology and cellular mechanisms of the signal transduction mechanisms of our sensory apparatus. But damn if I'm still not amazed by the actual experience of sensation. Even beyond the philosophical wonder of passively sampling our outside environment in a shared, meaningful fashion is the ridiculous sensitivity of our senses. We're used to thinking of our senses as being pretty shite: we can't see as well as eagles, we can't hear as well as bats, and we can't smell as well as dogs. Or so we're used to thinking. It turns out that humans can, in fact, detect as few as 2 photons entering the retina. Two. As in, one-plus-one. It is often said that, under ideal conditions, a young, healthy person can see a candle flame from 30 miles away. That's like being able to see a candle in Times Square from Stamford, Connecticut. Or seeing a candle in Candlestick Park from Napa Valley. We can also smell as few as 30 molecules of certain substances. I mean, we're talking serious Daredevil-level detection here! These facts suggest that we all have some level of what we'd normally think of as "super human" sensory abilities already. But what the hell? If I can supposedly see a candle from 30 miles away, why do I still crack my frakkin' shin on the coffee table when it's only slightly dark in my living room? How can we see TWO PHOTONS, but miss THAT!? You see, in the experiments testing the physical limits of the human sensory systems, the subjects involved are dedicating a lot of attention to the one sense being tested, almost certainly at the exclusion of the other senses. I think we all have a pretty intuitive grasp of this. And sometimes our intuitive corrections are pretty damn funny. If you watch people's behavior carefully you'll notice some strange behaviors that we do. Have you ever been driving around, trying to find a particular address, and then turn down the radio as you get close to where you think your destination is? Why would you turn down the radio when what you're doing is looking for an address? Seems pretty silly. Do you close your eyes when you're trying to do calculations in your head? Why? I think the answer to these questions is because we're trying to reduce sources of noise to maximize the amount of attention we can pay to the task at hand. The sounds from the radio capture your attention, making it hard to visually search for the address numbers on the house you're trying to find. Visual distractions in our surroundings may prevent us from maximally focusing our attention internally when trying to do hard math problems in our heads. It strikes me that the experiments on the physical limits of our perception are probably also related to the adage that if you lose one sense, your remaining senses get heightened. 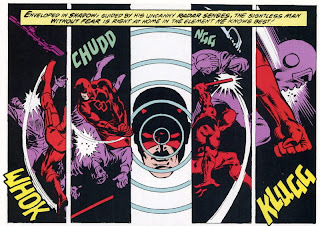 This is a pretty common saying, but is it really true that if I became blind that I'd suddenly gain super-human hearing? In a series of Nature studies published in the 1990s, it was shown that blind subjects reading via Braille actually use their visual cortex when reading by touch. This was demonstrated not only using brain imaging (PET, in this case), but also more causally via disruption of the visual cortex via TMS, a technique that can safely and reversibly disrupt the ability of a small region of the brain to process stimuli. When TMS was used to disrupt the visual cortex of blind subjects, their ability to read Braille characters dropped! Anecdotally, the impressive sensory adaptations by blind people can be seen in two particularly striking subjects. The first is a blind boy who was able to navigate so well via echolocating his own clicking sounds that he could ride a skateboard. The second example is of another blind young man who was able to play video games by sound alone. The guy could track the sounds in a game and use them to play through to completion. In my own research I've tried to identify which regions of the brain are critical for attention and working memory, to understand how cognitive functions reorganize after brain damage, and to provide a physiological basis for how sensory and cognitive systems could interact. In my future research I will further examine how sensory and cognitive systems interact and interrelate in more detail. For now, sometimes the only thing I can do is sit back and marvel at how amazing it is that this three pounds of fat and water in my head does anything at all. I love these "sense of awe" posts from other fields. They are fantastic nuggets of excitement and also great glosses of the current activity and theories. Thanks for sharing the passion! Fantastic post. Being a journalist, I absolutely admire your style. Wow, thanks tr and pspealman. Thankfully the brain is pretty cool as is. It's not too hard to make it interesting. > Her research is done in a Quincy laboratory. The threshold for visual perception of motion is just under what the moon (and sun) does. is: why does "red" look *that way*. This stuff is facinating. So is the challenge with attention (1) the limited bandwidth available to move large quantities of granular information across the skullwall, or (2) the ability to develop and maintain a sufficiently detailed internal model of reality into which to fit large quantities of granular information, or (3) something else? Some other forms of enhanced (but apparently useless) perceptions..
* Peripheral vision.. normal vision is like a tunnel in the center of view. But if you sit and concentrate you can look straight ahead and see the entire visual field out to the sides without moving your eyes, about 160-170 degrees. * Tinnitus.. probably everyone has it, but only some notice it. Go from a really loud room to a quiet room, and you may hear a buzzing or tone in your head related to this. The sounds heard change with brain activity, and can probably be used as a personal brainwave monitor. * Visual static or visual snow.. an apparant motion of pointilistic dots seen on flat shaded surfaces. Just try looking at a large single color object for a few minutes and see if you notice this "in" the surface. Can be seen instantly on any flat surface with practice, though this "skill" is useless, apparenty. * Specific region sensory enhancement.. think about your teeth, and try to concentrate on really feeling them, the way your tongue rests on back of your teeth, the feel of the tooth in the gum, the lips touching the front of the teeth... Didn't notice that before? It's all highly interesting stuff. Anonymous; I'm not sure what you're saying. Are you saying we don't understand emotions, or that we don't know why "blue" means "sad" in English? Because the former I'll agree with you; the latter we know pretty decently. great!! I remember one night about ten years ago whilst nursing my mother at home who was dying from a brain tumour (Gioblastoma Multiforme), one evening she asked me to turn up the TV as it was "too soft", naturally i did as she asked, i sat down again and she asked again, "a bit louder dear i still can't hear it too well", this went on two or three times more and the TV was blaring loud by this time when i finally twigged she'd gone deaf! I actually said to her, standing in front of the TV "You're stone cold deaf! ", she said "no i'm not, i can hear YOU", so i then put my hand over my mouth and asked if she could hear me.... silence! What blew me away was the fact that not only could she "hear" me with her eyes, but that she could faintly hear the TV characters as well. Only about a week before, my mother had part of the tumour resected (cut away), so her head was still in bandages (the tumour being behind the right ear). So i said to her "Humour me a sec, hold your head in your hands and shake your head back and forth for about half a minute", well she thought i was nuts, but she did as i asked and after the shaking i put my hand over my mouth and asked if she could hear me, she was amazed, "How did you know THAT would work???" Truth be told i didn't but a logical conclusion to having ANY operation is swelling and white blood cells invading the site to repair things, so i figured it was fluid around those sensory areas which had put pressure on the wrong spot and voila, deaf as a post. So the shaking just moved the fluid enough to relieve the pressure. After watching that video I was just speechless. I think he is going to be the next hero of the movie daredevil 2. I mean just look at his skills. This is the result of true concentration. This guy knows how to concentrate. Hats off to Ben.